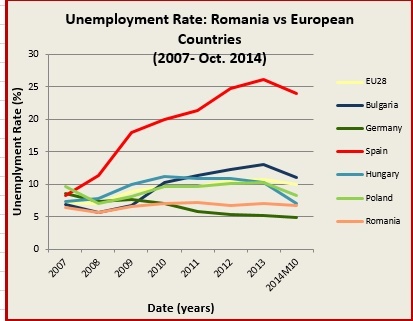 Comment: Unemployment in Romania – why do figures differ from one agency to the other? For many, it can be frustrating to learn about unemployment in Romania. When reading the National Agency for Employment (ANOFM) statistics, one finds out that Romanians are more or less happily employed, with an unemployment rate, for October, little above the 5% level. But when reading the National Institute of Statistics (INS) press releases, the statistics are less optimistic, showing a higher figure, around 7%. Why does the gap happen, and which one is wrong? How come they coexist, why don’t they even follow the same trend? It’s simple. ANOFM presents data calculated exclusively based on the employment request forms filled in by individuals. Of course it is very accurate, but it also depends on the unemployed persons’ possibility/willingness to fill in those forms. INS calculates data using the International Labor Organization methodology. Its formulas are based on household surveys, so its stats include a larger base of individuals, such as, for instance, those who are not employed but who did not filled in unemployment documents with ANOFM. Let’s have a look at the data. Source: Eurostat, INS, Hungarian Central Statistical Office, own calculations. All in all, when searching for comparable statistics, INS gives with a higher accuracy the needed answer. But one should also keep in mind that, although rates can be comparable, the variables behind them can sometimes be sources of discrepancies: the benefit duration, the eligibility conditions, the benefit “generosity”, the differences in the tax rules, just to name a few.